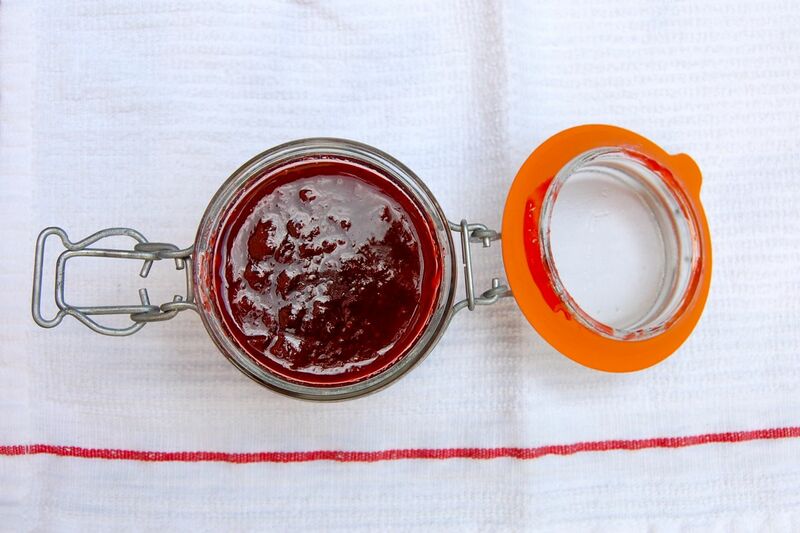 Homemade strawberry jam: good on ice cream, better on buttery toast. I think I may turn into the Violet Beauregarde of strawberries. I've been buying up farmers market berries like I may never see the fruit again. I can't help myself. The past month, I stroll casually past the tables loaded with bright red fruit, and tell myself, You really don't need any more strawberries. Pint after pint have already gone into strawberry rhubarb crisps, strawberries and cream, strawberries every morning for breakfast, and an attempt at strawberry juice to flavor sparkling water. Yet I feed my habit and buy even more. So, I've turned to jam (as a way to use up surplus fruit, not literally). Local strawberries will soon disappear from the farmers markets, so go grab a few pints while you can and try out this simple jam recipe. In a medium-sized pot, add the strawberries and sugar, and crush the mixture with the back of a spoon or fork to break up most of the berries. Throw in half a vanilla bean if you have one. Bring mixture to a boil over medium-high heat. Reduce heat to medium and gently boil for 10 minutes, stirring frequently and skimming off the foam. Add lemon juice and continue cooking for 25 minutes, stirring occasionally and skimming off the foam. Remove from heat and allow jam to cool. Store the jam in an air-tight container in the fridge for up to two weeks. good for you! I have also been obsessed with strawberries this year but I never did get around to making jam with any of them. Luckily, we have started the cherry and raspberry season this past weekend at 14&U and BFM. And I am hearing rumors of blueberries already. 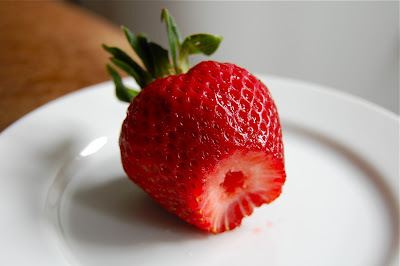 But it is true that the strawberries were particularly appealing and I never got enough of them. I like how the vanilla beans scent perfectly complimented the taste.